United State Marine Corps Sergeant Kevin English was injured on numerous occasions while carrying out three separate combat tours in Iraq from 2003 to 2006. He was honorably discharged in November of 2006. During English’s second deployment, he was seriously injured in an incident involving a Humvee. Sergeant English was sent airborne and landed on his neck. He suffered serious back and neck injuries which required him to undergo a surgical procedure on his neck. Sergeant English has long term degenerative disc disease. The significance of the cervical trauma over time had caused a breakdown of his ligaments, and reduced muscle strength. Chronic cervical strain is a common cause of migraine headaches, and muscle spasms that affect the neck, jaw, face, eyes, arms, and shoulders. During his time in the service, he earned the Rifle Expert Badge, Pistol Marksman Badge, Certificate of Appreciation, Marine Corps Good Conduct Medal, Combat Action Ribbon, Sea Service Deployment Ribbon, Iraq Campaign Medal, Global War on Terrorism Service Medal, Global War on Terrorism Expeditionary Medal, National Defense Service Medal, and a Certificate of Commendation. 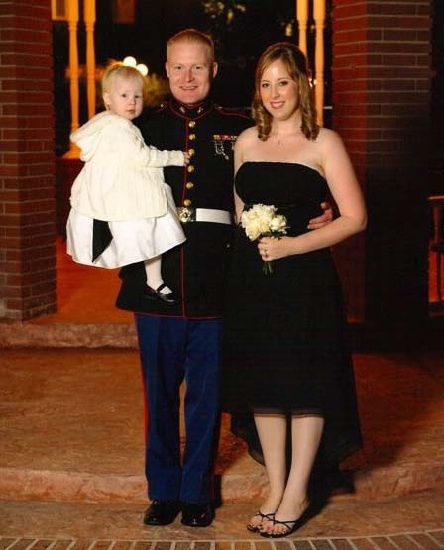 Sergeant English, his wife Lindsey and daughters Isabelle and Abigail were gifted a home in Arizona.